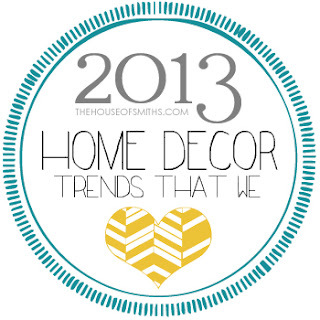 We're back with another post about 2013 home decor trends that we love. It was pretty entertaining looking over everyone's feedback and opinions about our last topic: Gorgeous Gold, seeing if you loved it or hated it. Mostly, I felt like the consensus was that a lot of you were willing to try a little of anything in your spaces, as long as it wasn't overkill. AWESOME! I love that attitude! Hopefully you'll feel the same about this next trend... which I think is a little easier to embrace, and also something that a lot of you might already have incorporated into your homes already. You may be asking yourself, what qualifies a blue as, "out of bounds"? Well, to me, it's shades of blues that don't get used quite as often as some others, that have made their way into the home decor and fashion world a little more lately. Peacock, Mint and Aquamarine/Teal that have really caught my eye these past few months! These vibrant, happy, unexpected blues and blue/greens are quickly becoming some of my ultimate favorites! At first I was a little weary to start adding these bolder shades into my home, because we're surrounded by lots of lighter blues and true greens, but after I took the plunge, I quickly realized how well these new shades complimented the colors that I already had! In true House of Smiths fashion, our first experience with one of these 'out of bounds blues' was pretty much the mentality of "go big or go home." 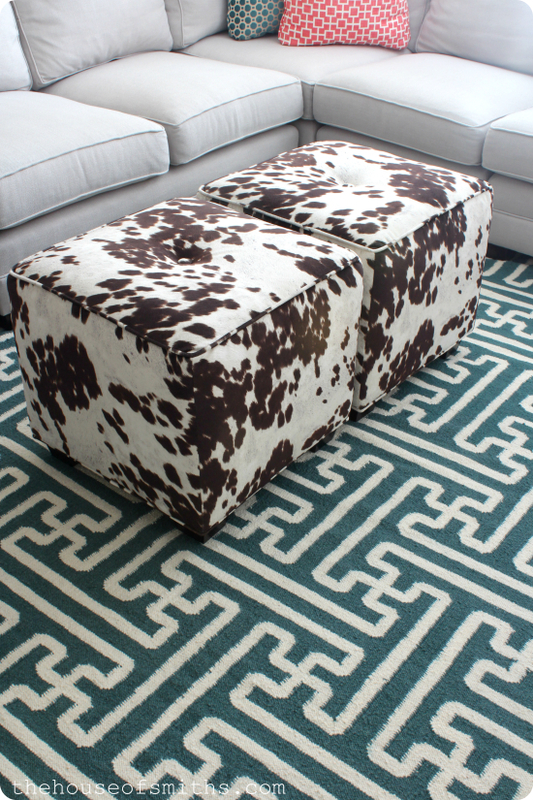 Cason and I both absolutely loved the deep peacock blue color of this geometric rug from The Black Goose Design, so when we were picking out finishes for our basement, we didn't hold back. We purchased it in an 8x11 foot size and crossed our finger, hoping we'd like it once it got here. Guess what? We do! It's the PERFECT color. Nothing like anything else in our house at all... which is actually a good thing! 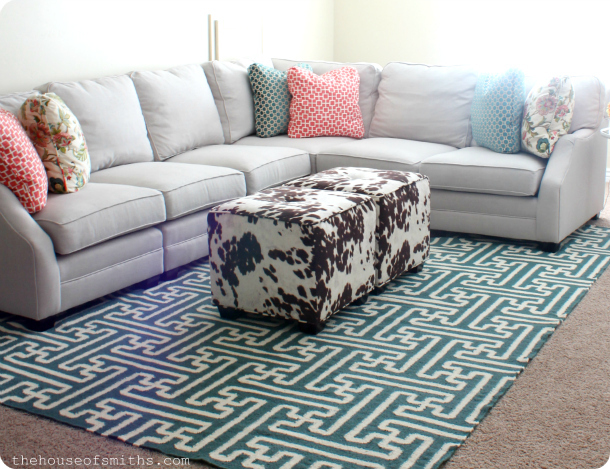 Like I mentioned before in our last basement reveal post, we wanted a rug that made a statement and that was darker in color, to hide any stains or spills that might happen... and this deep peacock blue has fit the bill for sure. Apparently I'm into rugs, when it comes to trying out new colors and trends; probably because they're easy to replace and trade out if you get sick them, sort of like pillows. We ordered this minty green, plush rug off of a Joss & Main sale not too long ago for our laundry room and I seriously adore it. While painting walls a fun new color is great, it definitely takes more time and commitment. Rugs, pillows and throws are just a quicker, easier way to work in new colors/patterns/trends into a space; not to mention more "renter friendly", for those of you who don't have the option to change the paint in your homes. We recently added a fab new table behind our sofa downstairs (more on that soon) and I just realized, without knowing it, that I worked in a couple of these new blues into the space as well, with the decor. Books are an awesome way to add height variation and color interest to the tabletops around your home, so if you want to see what a little peacock blue, mint or aquamarine may look like in your space, head to your bookshelf to see if you've got any hardbacks that meet those requirements, and then stack a few up on a table somewhere! If you don't have any of those colors, then take a few minutes to cover the outside of a few books with paper or fabric, to match the shades you're going for. 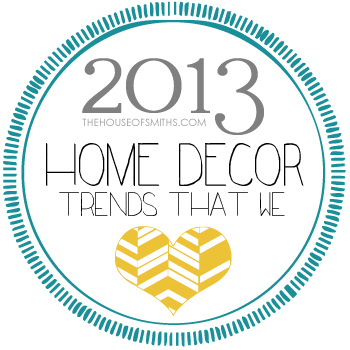 A quick, easy and cheap makeover for instant, "on-trend" decor. So what do you think? Are these out of bounds blues a little easier to swallow than the gold and brass were? Do you already have one or more of these chic shades in your home? If not, which of these three beautiful blues would you choose to incorporate into YOUR space? This post is so perfectly timed, I had to laugh. As I finish painting my daughter's room blue and look forward to panting my son's room navy, I started looking around my house at all the hues of blue. I almost wrote a post about it earlier, showcasing the blues in all of our house. So obviously, I love all things blue! Dishes, paint, rugs, pillows, mats in picture frames, picture frames, art work, rocks (geodes from my grandfather's collection), flower pots, curtains and so much more! I painted my living room blue a few years ago. My daughter loved it so much her bedroom is now that color and so is her bathroom (although it looks teal in there). Blue is one of my favorite colors. It's so versatile and complements all colors depending on which shade you use. 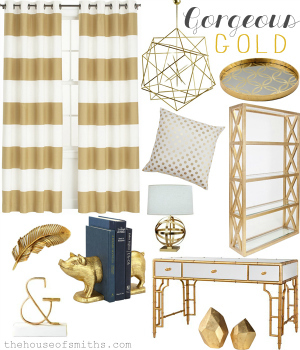 LOVE that gold table in the last pic!! I love how chic your home is decorated but also realistic and practical like a real family lives there......so encouraging! :) I'm totally crushing on those blues as well! The blues are definitely more to my liking. I don't care at all for gold! I'll even admit to hating it. Love the blue/green colors. So pretty! I'm a huge fan of color, and I love that these blues are strong yet still soothing! Already have those colors in my home......LOVE, LOVE, LOVE them! I must admit that I'm not quite ready to accept the gold trend, yet. It still brings back too much of the brassy 80's vibe with that peach, forest green and dusty pink for me! It works in your home with the out of bounds blue that you have. THAT trend is one that I could live with for a pop of colour in accents and fabrics! Thanks for the ideas. I love to add new colors with books. It's so easy! Just painted our large master bedroom dresser a peacock blue. It is a great punch of color! I love your style and all your little pops of color! Here is the link to see the before and after! 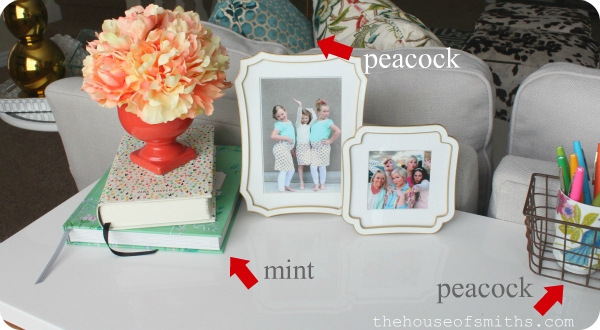 We are planning on using a lot of Peacock Blues and teals in our new home décor. I've got my eye on a pair of Out of Bounds Blue chairs from Thrive I'm thinking I need. Great minds think alike. I'm preparing to reupholster my sofa in turquoise velvet. I've been ordering swatch samples like crazy! 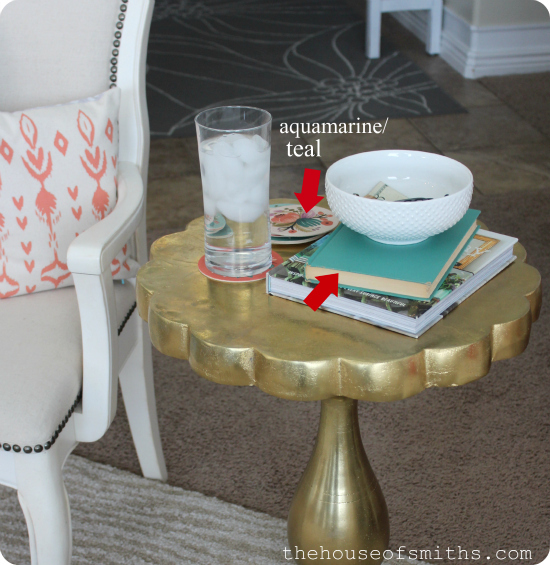 I have been obsessed with aqua marine for quite some time now and have a lot of it in different places throughout my home. I never decorated much with the other colors, however I just scored a vintage campaign dresser (on CL for $30!! )that I'm really considering painting a color somewhere between deep peacock and midnight blue...what do you think of that "out of bounds blue"?? I adore all shades of blue. In fact, my downstairs powder room went 'Ocean Depths' teal this year! My husband calls it the Tan Smurf room, but I love the deep, peacock teal color in there. I just painted a mint boarder in our master bath around the ceiling to give the eye a feeling of space in a tiny room. After I painted it I realized I liked it so much it may make its way into the rest of the bedroom. Oh I was ahead of the curve! 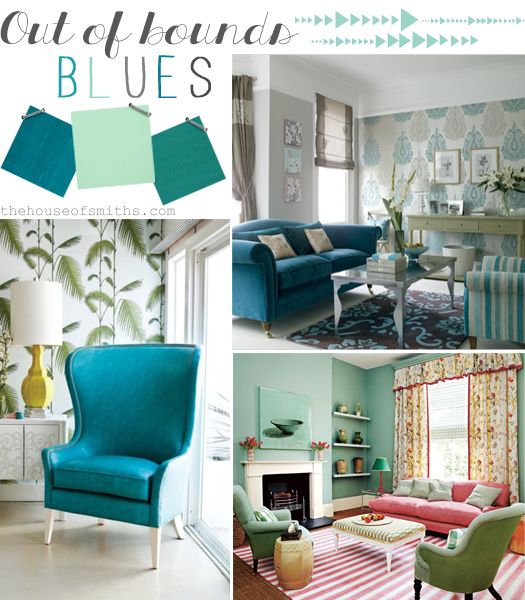 I love teal and blues, they are everywhere in my house - drinking glasses included! Do you have a source for those four pictures you used in the "Out of Bounds Blues" collage? I'm loving the room in the bottom right corner with the pink and white striped rug and would like to see more pictures. I'm on board with the new blues. I recently painted my kitchen chairs a mint color. I loved them so much I did an accent wall the same color. I'm obsessed with it...It's starting to show up in my wardrobe too. Hello. Can you tell me where you got that great drum light fixture in your laundry room? Need one just like it for a kitchen light fixture over my dining room table.